Deep crustal reflections, appearing at two-way times of 6-20 s, are characterised by a low signal-to-noise ratio and a low-frequency content (~ 5-30 Hz). Optimising the visibility of these reflections requires that: 1. (1) the source energy be concentrated in this band; 2. (2) the receiver be as long as practically possible; 3. (3) the shot spacing be as snail as possible. An airgun array simulation program was used to investigate the effect of operating a 10-gun array at different depths. 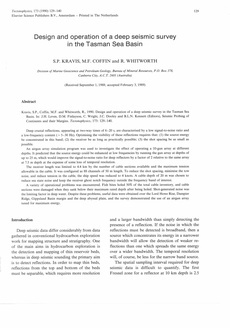 It predicted that the source energy could be enhanced at low frequencies by running the gun array at depths of up to 25 m, which would improve the signal-to-noise ratio for deep reflectors by a factor of 2 relative to the same array at 7.5 m depth at the expense of some loss of temporal resolution. The receiver length was limited to 4.4 km by the number of cable sections available and the maximum tension allowable in the cable. It was configured as 88 channels of 50 m length. To reduce the shot spacing, minimise the tow noise and reduce tension in the cable, the ship speed was reduced to 4 knots. A cable depth of 20 m was chosen to reduce sea state noise and keep the receiver ghost notch frequency outside the frequency band of interest. A variety of operational problems was encountered. Fish bites holed 50% of the total cable inventory and cable sections were damaged when they sank below their maximum rated depth after being holed. Shot-generated noise was the limiting factor in deep water. Despite these problems, useful data were obtained over the Lord Howe Rise, Dampier Ridge, Gippsland Basin margin and the deep abyssal plain and the survey demonstrated the use of an airgun array tuned for maximum energy. © 1990.